I LOVE YOTSUBATO! (Sorry… I get easily excited.) Besides being my personal favorite manga series – so, ahem, I might be a bit biased – and besides the fact that it’s the cutest darn manga ever… I think Yotsubato is something every Japanese-learner should read once, especially if you’ve never read through a manga in its original language or think you’re not smart enough to read “real Japanese” yet. A long time ago, back in the days when my Anki deck had 300 cards, the days when I still hadn’t figured out how to conjugate group-one verbs, and in the days when I still watched anime with the dreaded English subtitles on, I had convinced myself that I wasn’t ready to read manga yet. Maybe when I reached 2,000 sentences, or hit the arbitrary level thirty on the JALUP scoreboards, I could understand a manga. I had already tried twice; I got a volume of Death Note and two of One Piece (They’re for kids, right? And they’re cool!) and gave them a try. Unfortunately, I just couldn’t figure them out. I didn’t even know what a well-intentioned “ふん” meant. So they were my excuses as to why I couldn’t read manga, at least until I found Yotsubato. 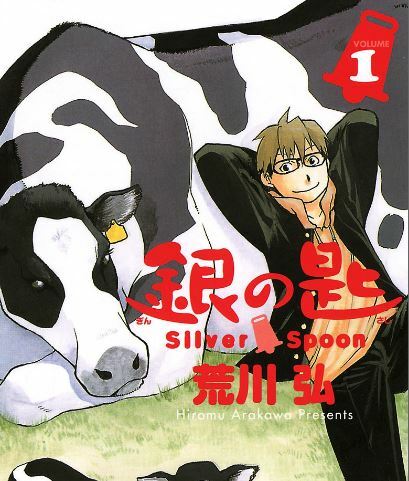 I had it at the recommendation of it being a good manga for beginners, but I didn’t have high expectations for my abilities. Surprisingly, I could actually read it. I was so happy when I finished the first chapter. It felt AWESOME!! That was the last time I told myself manga was too hard for my poor, shriveled up brain. 2. Everyone can read it. It’s hard if you’re a natural perfectionist to skip whole conversations, but there’s no need to get everything right. Skim over things. It’s no fun if you force yourself to have two dictionaries, an encyclopedia and a grammar book open next to you while you read. But if you’d like to have a better understanding of it, come back later once you’ve read through it and go over what you missed last time. Sometimes I mark down words I’d like to add to my Anki deck on a piece of paper next to me while I’m reading. Yotsubato! has plenty of furigana, so it’s never a chore to look anything up. Another thing that scares people off is slang. The dreaded slang. 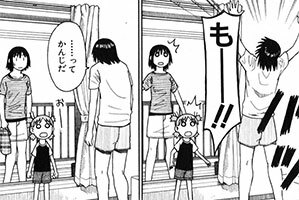 Yotsubato isn’t free of slang – Yotsuba’s dad isn’t exactly the most eloquent speaker – but it’s nothing you usually can’t figure out by reading it out loud. じゃねぇ is a bit easier to say than じゃない, after all, and who can remember to say しまう when ちゃう is just as good? Of course, anything you can’t parse can usually be filled in by context. I never laugh out loud. 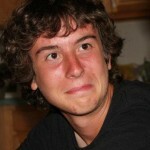 The closest I ever get to laughing out loud is writing an “lol” on somebody’s Facebook status. But for some reason, Yotsubato always gets me laughing. I giggle like a little kid. I have to take care to read it alone lest everybody I know think I’ve lost my marbles. The art is especially hilarious. Unless you have a heart made out of steel and cardboard, I think it’s impossible not to laugh at Yotsuba’s many expressions. It’s actually the funniest thing I think I’ve ever read. I agree totally! 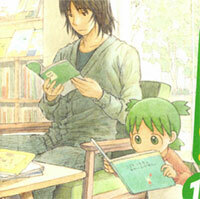 Beginner or not, Yotsuba is an awesome manga to have in one’s collection. I picked it up from my in-law’s bookshelf and instantly fell in love. And yes, it will make you laugh out loud! Once, I had to put it down before class just because it was just getting too funny. It was the first manga I bought and indeed it is easy to read even if you have only basic japanese knowledge. With Doreamon, there were the 2 manga I recommmended on my blog. I tried to read others like Death Note and Naruto, but they weren’t that easy for starters. You can also download the PDF version and read it in your kindle/tablet. For anyone who wants a preview, they actually have two sample episodes uploaded online here: http://yotuba.com/yotu_comics.html. Yeah, I agree. I remember the first one took me a couple of weeks to read through and the second one I finished in just a few hours. The sample episode about the water gun was so funny!!! It validated everything Eric wrote about. I’m sold. Thanks for the recommendation! 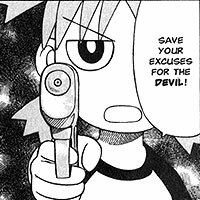 Yotsubato is one of the greatest creations to have come out of Japan in a while. The refreshingly everyday subject matter combined with its gorgeous visual appeal and loveable characters just makes for the most satisfying reading ever. And on top of that, it’s perfect for Japanese learners with its everyday vocabulary and ordinary dialects. Makes for easily understandable passages. And as I mentioned over on nayugen.com, the great thing about Yotsubat is that she is a young girl so she is technically learning Japanese at the same time as you are. So when she needs a difficult word explained, the adults are there to explain it to her. Thus, avoid reading this manga with a dictionary! Just know that sometimes Yotsuba makes mistakes with her Japanese so you don’t want to mimic her too closely. But she’s so wonderful. And I love the continuous inside jokes that run throughout the series. Perfection in manga form. 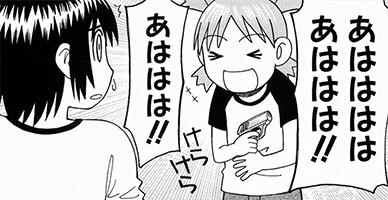 For those who might be interested, someone put together an Anki deck of all the vocabulary from Yotsubato. Unfortunately they aren’t sentences though. Thanks Kal!! The audio is a great addition!! Where did you get the audio clips? There is now a Yotsubato Volume 2 Anki deck and I want to add audio to it. I used the female voice, ‘Misaki’, because I think she sounds a bit more natural than the male voice. However, if you want to I could put up a version of my script you could use yourself to add the audio files. I also believe there’s a text to speech plugin for Anki that can handle Japanese but I haven’t used it myself so I don’t know how good it is. WOW!! The audio clips sounded like natural speech, not computer generated. Yes, I would like to try your RUBY script. My email is kanji2136@gmail.com. Thanks!! To use the script you first have to import the deck that you get when you buy the vocabulary pack in to Anki. Then in the menu, click File -> Export and choose Export Format -> Notes in Plain Text and uncheck “Include tags”. Then save the file in a folder anywhere on your computer. Next, copy the script in to the folder where you exported the notes to. Now open up cmd.exe (press the Windows button and type “cmd” in the search box) and navigate to the folder with the “cd” command. Now the script should start to download the wav files in to a subfolder called tts. It should also generate a file called “import_me.txt”. When the script is finished, copy all the downloaded files to your Anki media folder (it’s in My Documents\Anki\(Your username)\collection.media). Next, click File -> Import and select the import_me.txt file. In the next dialog choose “Import even if the existing note has the same field” and for the Field Mapping you need to have three fields where the first field should be on the question side of the card, and the second and third field should be on the answer side of the card. This works for both the volume 1 deck and the volume 2 deck, and it will most likely work for any future decks Yotsubato decks he might release. It looks like your file was removed or moved on dropbox… any way that you can put it up again? It looks like a great resource and I am in dire need of listening practice! I’ve been trying to find these at the Japanese used bookstores near me for a while with no luck yet :( I really want to read it though! I’ve read a little in English (my library has it) and it’s utterly adorable! I loved the idea. I’ll check around here if I can find it. I’m starting to tire of reading the same manga over and over again. So I read the first one and loved it. I def LOLed out loud in the manga cafe I was in (in Osaka). Thanks for the recommendation. It was easy enough for me to finish in an hour and half. Fastest I’ve ever read one manga. You were right about the easy peasy Japanese and how they explain difficult words for her. Love it! Since you asked for other easy-to-read manga recommendations, here’s a few that I’ve found to be indispensable. スーパーマリオくん, ぼくはガリレオ, キメルのＹＯＹＯ！,　ぶっとびスピナーキメル！！, and 怪盗ジョーカー are some series I’ve found to like quite a bit (and they all incidentally are or have been serialized in 月刊コロコロコミック). It was especially easy to pick up new words with these series without having to refer to a dictionary constantly. A few of the words I remember picking up this way were ついでに, 雹, and 上昇. Look what you made me do Eric!! What a wonderful package to receive! Even though I already own Yotsubato, I’m still jealous! 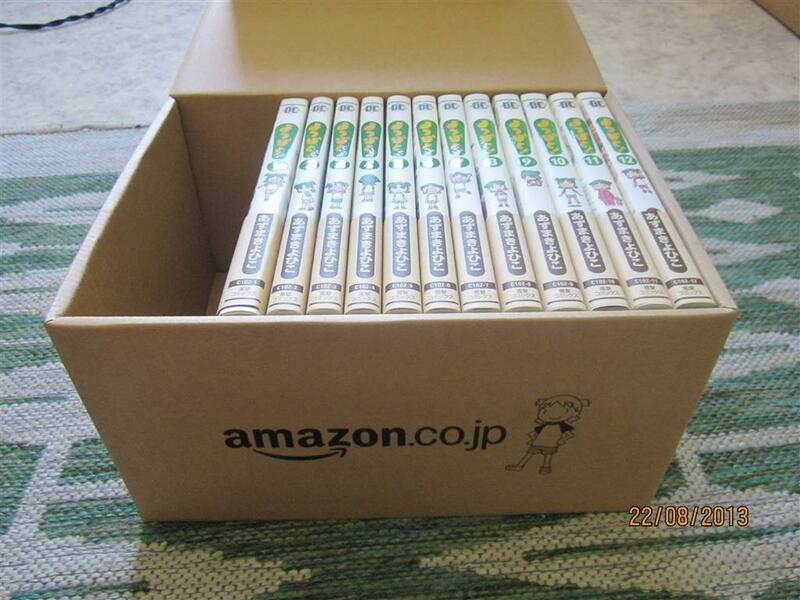 I love that Yotsuba is actually printed on the box from Amazon.jp. Or did you draw that in yourself? I think the box face is taken from the manga? I started reading the first volume yesterday and I gotta say that working a bit on the Yotsuba Anki deck has been very helpful so far. It’s nice to have already seen the majority of the words because that way I don’t have to constantly go look up words which would break the reading immersion. I still look up things I forgot or don’t understand in the context, but much less so than if I hadn’t already studied the vocabulary. Awesome stuff. You’re Swedish too, right? 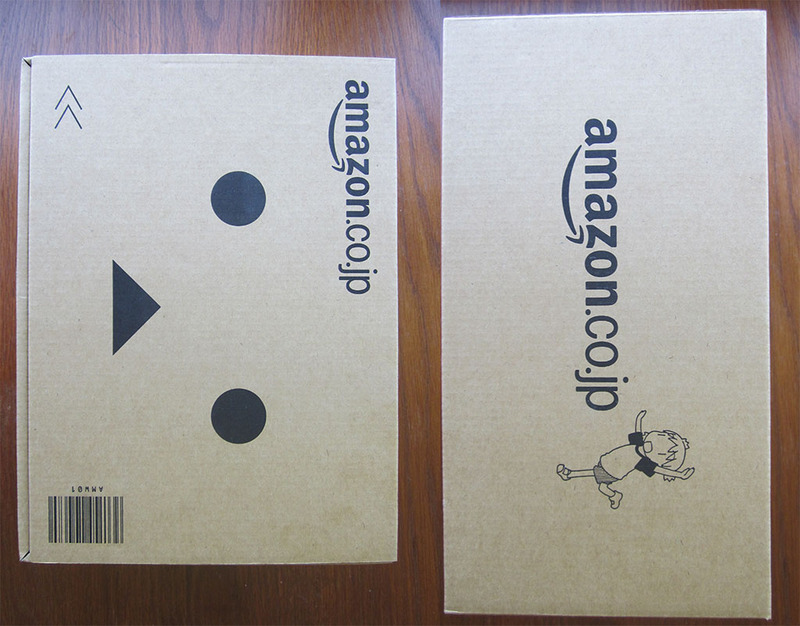 Did you have any problems with the order or shipment from Japanese amazon? I’m trying to gather a list of books myself to order, to prepare for my upcoming J-J phase. Well I did place an order earlier today ^^ 7 books of various genres. I was especially drawn to one with the title スラムオンライン. 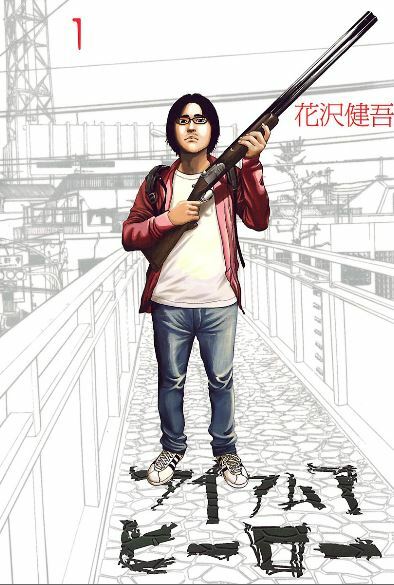 A contemporary setting about slums in an MMORPg… hmm… sounds both fun and suitable for the upcoming JJ sentence mining. Bumping this up for relevance. Great Manga! One issue with ALL manga for all of us with less than perfect eyes is the absolutely microscopic furigana. I love being able to magnify web pages so that furigana are readable to those of us without super-magnifico-vision. I find I need to wear 2x reading glasses to actually see some of the characters/kana in manga. Just wondering, does anyone else have this problem? Still love it, tho…. You might want to try using an e-reader where you can zoom in on the text. I have the same problem with よつばと it’s pretty hard to read. I do prefer to actually hold the manga in my hands rather than read it on my tablet or pc screen, it seems to help me a bit. I also just got vol 2, and it seems to me like the text is a lot clearer and easier to read than my copy of vol 1. Dunno if it’s just the quality or if they changed something or what. 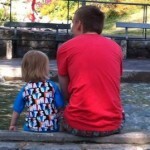 I’ve also tried to zoom in, but it doesn’t work well unless the quality of the digital copy is really high. I actually do use a magnifying glass. Although I feel (and probably look) like an old man, I have to admit I like using it. Practicalities aside, it has a way of drawing you in as well. It brings the artwork, not just the words, closer and it helps create an absorbing experience. Imagine something like the visual surround effect of a Viewmaster. Give it a try online first if you’re not sure! I personally just caught up to it and I didn’t have that problem, although I’m only in JALUP Beginner. Most of the times, the adults / older kids will take about the same things and you’ll see what kanji she should’ve said, and THEN you’ll be certain of whats happening. Yeah, I felt the same way when I first started reading it, I love Kanji. But honestly, it’s not that hard, she usually speaks in short sentences and you can usually figure out what she’s talking about from context. And it’s OK if you don’t understand 100%. At your level, I think you should be fine, that was right around the time I started reading よつばと. Thanks for your input! I wasn’t actually concerned about it being too hard, quite the opposite. Kanji can’t be avoided in real life so I like to make sure I’m reading things that use them. But I see what you mean now that I think about it, with it being hard to tell what words she’s using without Kanji. It seems like a really heartwarming story and I’d love to read it, I’m just concerned it won’t be as helpful learning-wise as something that used more Kanji. People don’t speak in kanji though. This too, it’s way too easy to get stuck in using kanji as a crutch and having your listening/speaking lag behind as a result, that’s what happened to me. Don’t stress about it so much.